"New Yorkers are obssessed with money, quantity. During the interviews, people always want to know how many kilometers I've run in my whole life, how many a day, whatever ... I really don't care. I'm only interested in living in harmony with nature and running for fun. That's it. I'm too old now to make performances. The most important thing is to be fulfilled in mind." - Alberto Arroyo, known as the mayor of Central Park, who died in a nursing home this week at age 94. Read the New York Times article on his death. How is Tavaris Tate not on the front page? Video of World Cross 2010? Another Kenyan Sweep! 10 points for Caleb Mwangangi Ndiku and Kenyans. *Trevor Dunbar On Africans: "We'll catch up with them eventually. But it won't be tomorrow." 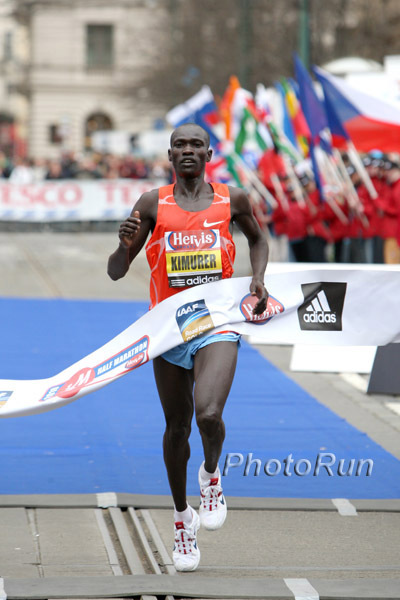 Prague HM Results: Joel Kemboi (Left) Wins By Over 1 Minute Marathoner Yemane Tsegay finished 3rd. *Kenya Goes 1-4 Led By Mercy Cherono 4 runners make up a team at World Cross and Kenya scored a perfect 10 to start the day. Live Results Looks like US senior women earn bronze team medal! IAAF Race Reports Kenyans dominate both junior and women's senior race - Senior men up soon. Full Results Shalane Flanagan 12th in the senior race, 1 minute behind surprise world senior champion Emily Chebet. The Mood Is Dark In Poland Only one UK journalist showed up and it looks like the meet is not going to be on TV in the UK or the US. IAAF Facing Financial Ruin In Four Years? That's one journalist's take on it, although some in Africa say it's a plot to get Seb Coe as head of the IAAF. Sounds like a good idea to us. On The Boards: Is/was this year's World XC Champs the best shot in a generation for the U.S. to win the men's individual senior title?